Gut bacteria may help newborn babies prepare for the bacteria that will soon enter their bodies, new research suggests. In a new paper, the researchers conclude that nonpathogenic E. coli serves a crucial function of preparing the gut for the development of the microbiome to come, and the onslaught of pathogenic, or harmful, microbes. The new results may help explain what past research has shown about the connection between the gut microbiome and the development of the newborn immune system. The findings may also lead to better understanding of what can protect or rescue premature newborns from the rare but devastating gut infection condition necrotizing enterocolitis, in which bacteria invade the gut wall and cause potentially fatal infection and inflammation. To do the research, the team studied a strain of E. coli related to ones commonly found in newborn babies’ stool. The researchers couldn’t do their research in actual newborns’ intestines, of course. 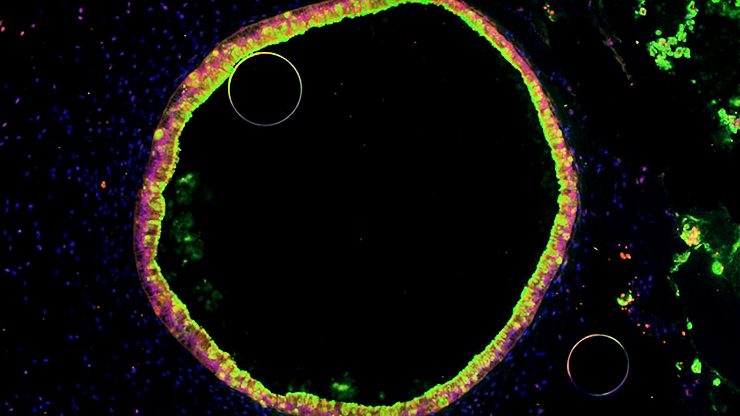 Instead, they used stem cells to grow miniature versions of the gut lining, called human intestinal organoids. Each HIO, as they’re called, is made up of thousands of cells that the scientists coax to grow, divide, and organize into structures that resemble the actual gut. At each HIO’s center is a hollow area called a lumen, which mimics the hollow inner portion of the tube-like human intestine. “We have previously shown that HIOs closely resemble the immature human intestine,” says lead author David Hill, a postdoctoral fellow in gastroenterology at Michigan Medicine, the University of Michigan’s academic medical center. During growth, the researchers kept these HIOs germ-free, just like the gut of a fetus in the womb. Then, they introduced the helpful E. coli into the hollow center of the organoids. The researchers tracked what happened inside the cells whose surfaces face the center and in the spaces between the cells. They looked at how the cells were altering gene activity over time in response to the introduction of E. coli. The results were clear. After the researchers introduced the E. coli, the cells facing the lumen began to mature, form tighter connections with one another, and produce mucus to coat their surface. Genes involved in cell-to-cell communication, and the physical structures cells use to link with their neighbors, activated. So did genes involved in making antimicrobial substances and mucus and transporting them to the cell surface. These genes are also involved in adaptation to low oxygen, which bacterial metabolism causes and is a hallmark of the mature adult intestine. This activity led the HIOs to develop better resistance to inflammation-causing stimuli, which meant less damage to the cells lining the lumen. “Our results show that colonization of the immature intestinal tract with E. coli results in intestinal tissue that is more robust to challenge by potentially damaging pathogens or inflammatory substances,” says senior author Jason Spence, an associate professor of internal medicine and of cell and developmental biology at the University of Michigan. The research grew out of cooperation between the Spence lab, which focuses on HIOs, and the Young lab, which focuses on the gut microbiome. The team is now studying additional strains of nonharmful E. coli and other bacteria that take up long-term residence in the newborn gut, as well as pathogens. The Spence team is preparing to launch a “core” service to provide HIOs for other researchers to study. The researchers report their findings in the journal eLife. The National Institutes of Health, and investments made by the University of Michigan Medical School funded the research.